The technology behind the Record/Replay functionality is built in to certain models of Intel and AMD processors. VMware calls it vLockstep. This technology required Intel and AMD to make changes to both the performance counter architecture and virtualization hardware assists (Intel VT and AMD-V) that are inside the physical processors. Because of this, only newer processors support the FT feature. This includes the third-gen AMD Opteron based on the AMD Barcelona, Budapest and Shanghai processor families, and Intel Xeon processors based on the Penryn and Nehalem micro-architectures and their successors. VMware has published a knowledgebase article that provides more details on this. CPU clock speeds between the two ESX hosts must be within 400 Mhz of each other. All VM disks must be “thick” (fully-allocated) and not thin; if a VM has a thin disk it will be converted to thick when FT is enabled. Most guest operating systems are supported with the following exceptions that apply only to hosts with third generation AMD Opteron processors (i.e. Barcelona, Budapest, Shanghai): Windows XP (32-bit), Windows 2000, Solaris 10 (32-bit). See this KB article for more. When ESX hosts are used together in an FT cluster, their processor speeds must be matched fairly closely to ensure that the hosts can stay in sync. VMware SiteSurvey will flag any CPU speeds that are different by more than 400 MHz. ESX hosts running the FT VM pair must be running at least ESX 4.0, and must be running the same build number of ESX. FT requires each member of the FT cluster to have a minimum of two NICs with speeds of at least 1 Gb per second. Each NIC must also be on the same network. 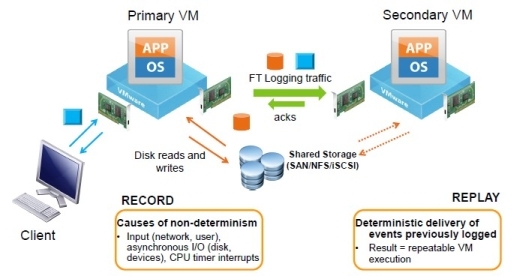 FT requires each member of the FT cluster to have two virtual NICs, one for logging and one for VMotion. VMware SiteSurvey will flag ESX hosts which do not contain as least two virtual NICs. 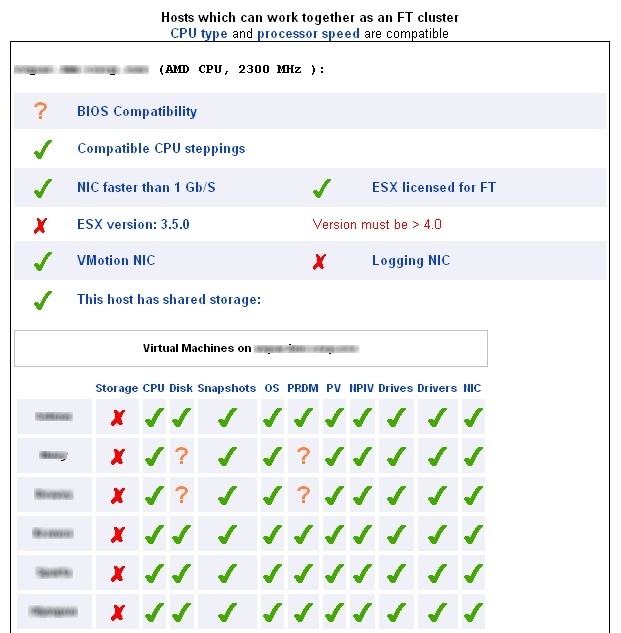 ESX hosts used together as a FT cluster must share storage for the protected VMs. For this reason VMware SiteSurvey lists the shared storage it detects for each ESX host and flags hosts that do not have shared storage in common. In addition, a FT-protected VM must itself be stored on shared storage and any disks connected to it must be shared storage. At this time, FT only supports single-processor virtual machines. VMware SiteSurvey flags virtual machines that are configured with more than one processor. To use FT with those VMs, you must reconfigure them as single-CPU VMs. FT will not work with virtual disks backed with thin-provisioned storage or disks that do not have clustering features enabled. When you turn on FT, the conversion to the appropriate disk format is performed by default. Snapshots must be removed before FT can be enabled on a virtual machine. 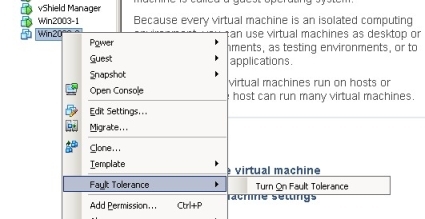 In addition, it is not possible to take snapshots of virtual machines on which FT is enabled. FT is not supported with virtual machines that have CD-ROM or floppy virtual devices backed by a physical or remote device. To use FT with a virtual machine with this issue, remove the CD-ROM or floppy virtual device or reconfigure the backing with an ISO installed on shared storage. Paravirtualized guests are not supported with FT. To use FT with a virtual machine with this issue, reconfigure the virtual machine without a VMI ROM. N_Port ID Virtualization (NPIV) is not supported with FT. To use FT with a virtual machine with this issue, disable the NPIV configuration of the virtual machine. 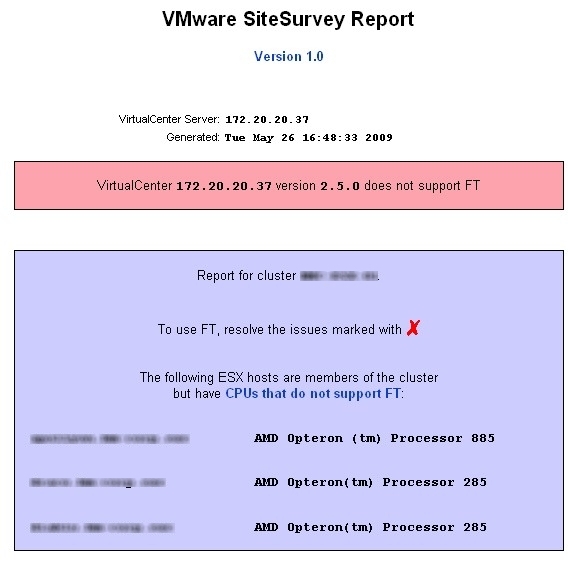 Before you enable FT be aware of one important limitation, VMware currently recommends that you do not use FT in a cluster that consists of a mix of ESX and ESXi hosts. The reason is that ESX hosts might become incompatible with ESXi hosts for FT purposes after they are patched, even when patched to the same level. This is a result of the patching process and will be resolved in a future release so that compatible ESX and ESXi versions are able to interoperate with FT even though patch numbers do not match exactly. Until this is resolved you will need to take this into consideration if you plan on using FT and make sure you adjust your clusters that will have FT enabled VMs so they only consist of only ESX or ESXi hosts and not both. VMware spent a lot of time working with Intel/AMD to refine their physical processors so VMware could implement its vLockstep technology, which replicates non-deterministic transactions between the processors by reproducing the CPU instructions on the other processor. All data is synchronized so there is no loss of data or transactions between the two systems. In the event of a hardware failure you may have an IP packet retransmitted, but there is no interruption in service or data loss as the secondary VM can always reproduce execution of the primary VM up to its last output. FT does not use a specific CPU feature but requires specific CPU families to function. vLockstep is more of a software solution that relies on some of the underlying functionality of the processors. The software level records the CPU instructions at the VM level and relies on the processor to do so; it has to be very accurate in terms of timing and VMware needed the processors to be modified by Intel and AMD to ensure complete accuracy. The SiteSurvey utility simply looks for certain CPU models and families, but not specific CPU features, to determine if a CPU is compatible with FT. In the future, VMware may update its CPU ID utility to also report if a CPU is FT capable. Currently there is a restriction that hosts must be running the same build of ESX/ESXi; this is a hard restriction and cannot be avoided. 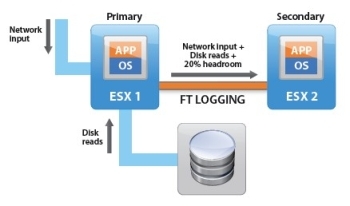 You can use FT between ESX and ESXi as long as they are the same build. Future releases may allow for hosts to have different builds. VMotion is supported on FT-enabled VMs, but you cannot VMotion both VMs at the same time. Storage VMotion is not supported on FT-enabled VMs. FT is compatible with Distributed Resource Scheduler (DRS) but will not automatically move the FT-enabled VMs between hosts to ensure reliability. This may change in a future release of FT. In the case of a split-brain scenarios (i.e. loss of network connectivity between hosts) the secondary VM may try and become the primary resulting in two primary VMs running at the same time. This is prevented by using a lock on a special FT file; once a failure is detected both VMs will try and rename this file, and if the secondary succeeds it becomes the primary and spawns a new secondary. If the secondary fails because the primary is still running and already has the file locked, the secondary VM is killed and a new secondary is spawned on another host. You can use FT on a vCenter Server running as a VM as long as it is running with a single vCPU. There is no limit to the amount of FT-enabled hosts in a cluster, but you cannot have FT-enabled VMs span clusters. A future release may support FT-enabled VMs spanning clusters. There is an API for FT that provides the ability to script certain actions like disabling/enabling FT using PowerShell. The four FT-enabled VM limit is per host, not per cluster, and is not a hard limit, but is recommended for optimal performance. The current version of FT is designed to be used between hosts in the same data center, and is not designed to work over wide area network (WAN) links between data centers due to latency issues and failover complications between sites. Future versions may be engineered to allow for FT usage between external data centers. Be aware that the secondary VM can slow down the primary VM if it is not getting enough CPU resources to keep up. This is noticeable by a lag time of several seconds or more. To resolve this try setting a CPU reservation on the primary VM which will also be applied to the secondary VM and will ensure they will run at the same CPU speed. If the secondary VM slows down to the point that it is severely impacting the performance of the primary VM, FT between the two will cease and a new secondary will be found on another host. When FT is enabled any memory limits on the primary VM will be removed and a memory reservation will be set equal to the amount of RAM assigned to the VM. You will be unable to change memory limits, shares or reservations on the primary VM while FT is enabled. Patching hosts can be tricky when using the FT feature because of the requirement that the hosts must have the build level. There are two methods you can use to accomplish this. The simplest method is to temporarily disable FT on any VMs that are using it, update all the hosts in the cluster to the same build level and then reenable FT on the VMs. This method requires FT to be disabled for a longer period of time; a workaround if you have four or more hosts in your cluster is to VMotion your FT enabled VMs so they are all on half your ESX hosts. Then update the hosts without the FT VMs so they are the same build levels. Once that is complete disable FT on the VMs, VMotion them to the updated hosts, reenable FT and a new secondary will be spawned on one of the updated hosts that has the same build level. Once all the FT VMs are moved and reenabled, update the remaining hosts so they are the same build level, and then VMotion the VMs so they are balanced among your hosts. great documentation.. really helpful for understanding FT in vSphere,Thanks for sharing such a good post..